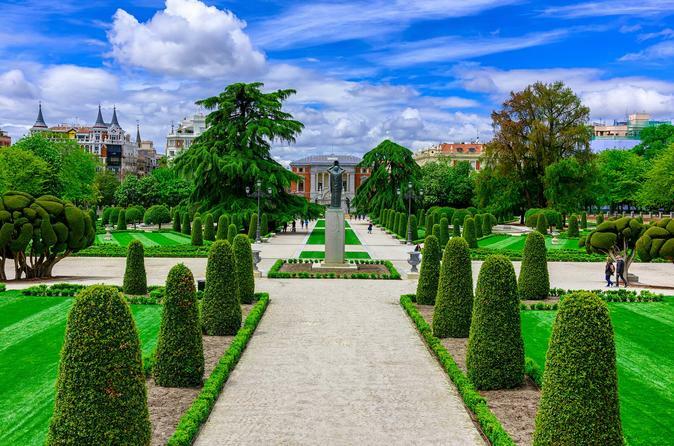 Delve into magnificent Buen Retiro Park, Madrid’s most popular relaxation spot, on a 1.5-hour small-group guided walking tour, and then enjoy skip-the-line entry to the Prado Museum. Stroll around the Retiro's gardens, tree-lined avenues and monuments as your guide details the park’s history and design. See the Crystal Palace, Church of San Jeronimos and other attractions, and afterward, enjoy fast-track entry to the world-famous Prado Museum. Explore independently to see works by El Greco, Goya and more, at your own pace. Numbers are limited to 14 for a personalized experience. Meet your guide near Buen Retiro Park (Parque del Buen Retiro), one of Madrid’s largest public parks. Head inside to explore the tree-lined avenues, lake and ornamental gardens. Absorb the relaxing atmosphere, and hear how the park was created by King Philip IV in the 1700s before opening to the public in 1868. Admire the manicured French-inspired Parterre Garden, and stroll around the artificial lake to the Monument to Alfonso XII and Crystal Palace (Palacio de Cristal). Pass Madrid’s oldest tree, a 400-year-old conifer used as a cannon mount by French troops during the Napoleonic Wars; and trace the shady avenues to attractions including the Statue of the Fallen Angel, the Galápagos Fountain and San Jeronimos Church, where King Juan Carlos was crowned in 1975. After around 1.5 hours, arrive at the Prado Museum, next to the park. Hear about its must-see artworks, leave your guide, and use your skip-the-line ticket to gain fast-track entry. Spend however long you wish exploring the galleries to see masterpieces such as Velazquez’s Las Meninas and Goya’s The Family of Carlos IV, as well as works by El Greco, Titian and other greats. Your experience ends when you leave the Prado.